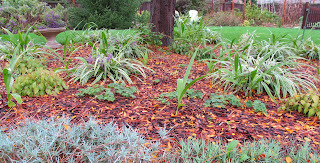 Welcome to Garden Bloggers' Bloom Day for October 2013. Here in my USDA Hardiness Zone 6a garden in central Indiana, the growing season is winding down, though we have not yet had any frost or freeze. Looking back on past bloom day posts for October, I think the garden is further along this year compared to other years, perhaps because August was so dry. But there are still blooms for those who go and look for them. One of the plants with the most blooms is Kalimerias pinnatifida 'Hortensis'. It's common name is Oxford Orphanage Plant. It is one of the three plants I brought back with me when I visited Elizabeth Lawrence's garden in the summer of 2012. I'm leaving it alone in hopes that it will self-sow itself throughout the garden. Lurking above this plant are the fading asters. I neglected to cut these back by half in late May and so they are taller than they've ever been. They look nice in this picture, but halfway down, they look like sticks with no leaves. 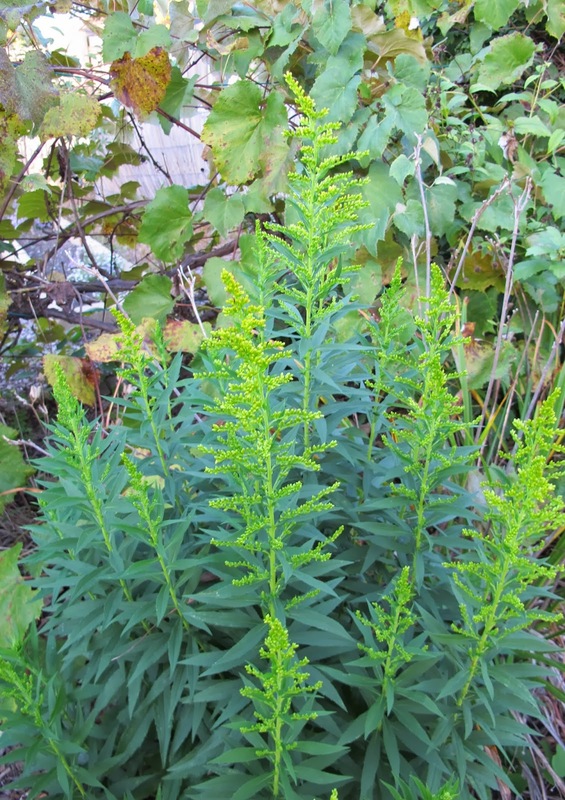 Another plant that I forgot to cut back by half in late spring is Short's Goldenrod, Solidago shortii 'Solar Cascade'. It's done blooming and is now flopped over, covering up this plant with yellow blooms. I wonder what those yellow blooms are? I've been so negligent with plant tags that there is no telling where the tag for the plant is. My best guess is that it is some kind of coreopsis. I thought the goldenrods were all bloomed out, but discovered this stand of goldenrod getting ready to bloom in another part of the garden. I'm not sure which goldenrod this is. I can only remember planting S. shortii, but I won't swear that this is a seedling from that one. 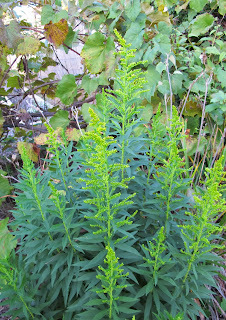 It could just be a wild goldenrod that sprouted up and I never weeded it out. I have been negligent in my weeding this year. I do have a couple of Colchicums in bloom. They look kind of lonely so I ordered another 36 Colchicum bulbs to keep them company, plus some bulbs for autumn crocus. I'll plant them in the garden border I call Bird's Blanket as soon as they arrive. I call this border "Bird's Blanket" because my garden designer described this as a quiet planting area, with repeating plants like quilt squares. It's shaded by a honey locust tree which seems to always be full of birds. I think Colchicums will be quiet enough for this area in their pale shades of violet and purple. The other blooms in this border right now include toad lilies, Tricytis sp. They aren't showy or flashy, but mark the end of our main season of bloom. In the days ahead, we'll shift our focus to the leaves as they turn color and to whatever floral flotsam makes it through the first frost which is surely not too far in our future. How's your garden blooming on this mid-October day? Thanks for hosting the GBBD meme again, lovely to see your October garden, I especially loved the Kalimeris pinnatifida ‘Hortensis', new to me, it is now on my wish list for next year! Hi Carol. Thank you for hosting this wonderful meme that I look forward to every month! You have quite a few blooms going on in your garden. The Tricytis is very interesting and your asters are huge! We are having a longer bloom season here as well on Long Island which I don't mind a bit...the longer the better! The colder weather will be here soon enough. Happy Bloom Day! Fall blooms are cherished here, as winter looms ahead..for now it's happy bloomday to all.. Thanks for hosting! That stand of Goldenrod getting ready to bloom is beautiful. I don't think I've ever seen that plant look so good. I thought it was just my Asters that had bare ugly stems, mine aren't even that tall! But there is lots still flowering in my Italian garden where it is a little like a second spring. Birds Blanklet sounds like a lovely way to describe part of the garden. I should try and get some toad lilies to extend the flowers in my garden. You've many lovely blooms in your garden! 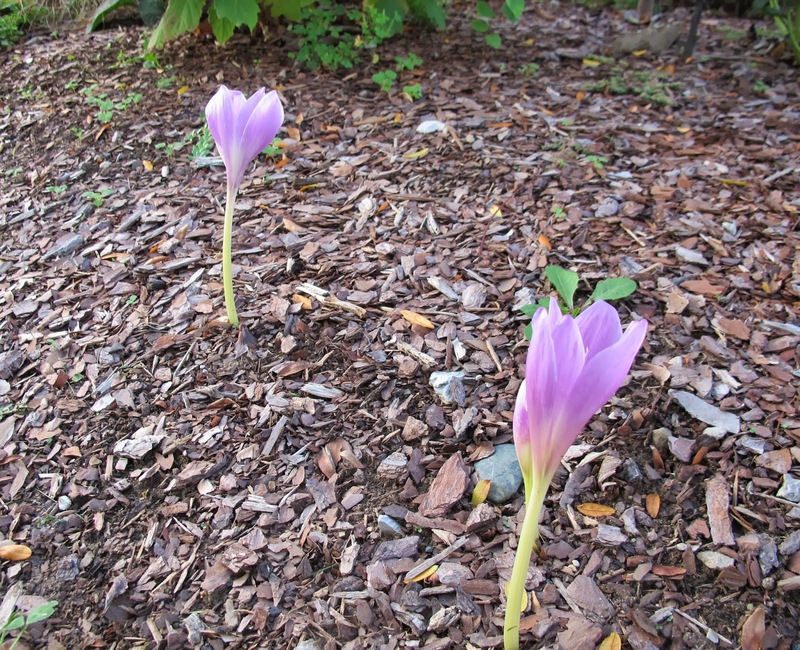 Our colchicum are already bloomed out this year. I wonder if you have some sort of wonderful later blooming variety? As usual, my bloom day post is a patchwork of whatever caught my eye while walking through my garden. Happy GBBD to you and thanks for hosting the party! Thanks for hosting. It took quite a bit more effort to find things to photograph this month, but its all there when I start digging. 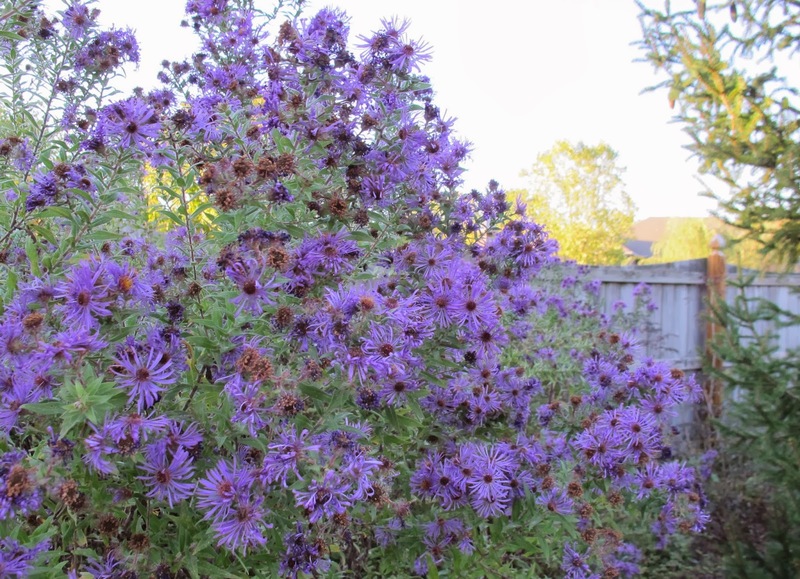 What lovely purple aster! Happy Autumn bloom day! From Kelli, Northern Ireland. Hi Carol. Oh your poor lonely colchicums! It is a familiar sight around here, as any bulbs I plant generally provide food for the mice. I am lucky to get two! Happy GBBD and thanks for hosting. It definitely looks like a Coreopsis to me Carol. Good to see your purples and yellows - I've been musing a lot about that colour combination since our trip to Ireland. To chop or not to chop, that is the question! HA Your October blooms look wonderful, Carol, but the thought of 36 more Colchicums sent shivers of delight up my spine. That will look perfectly quiet and serene, I know. Similar blooms here too and add to that roses...helianthus is still going and that with asters is keeping the monarchs here. Happy GBBD to you Carol, and thank you for hosting another month. No frosts or freezes here yet either, though we never get one until sometime in November. No fall color to speak of yet either, unless you count what's blooming on my post. I sometimes miss the 'Chelsea Chop' which happens just a bit later here than the flower show of that name. There is so much to chop and so little time something always goes unnoticed 'til it teeters on lanky stems. Enjoy this Bloom Day and thanks, once again. Beautiful October garden! I have the Toad Lilies too - my first time this year. And I love them. Thanks for hosting GBBD! Happy GBBD! I love your tall asters. Mine hug the ground and Alma Potchke who is taller is already gone. I am always surprised at how different blooms are in essentially the same growing zone. Hi Carol, I posted my GBBD post last night even before the 15th of the month...a record for me!! I am just now linking it here, as when I posted it, you hadn't yet put your post up! Could your yellow flower be Helanthus salicifolius (Willow Leaved Sunflower)?? Mine is in bloom right now...it's a native, too! As is so often the case, you have a lot more happening in your garden than mine. Here it is mainly toad lilies. ...that is spelled Helianthus--not Helanthus, had to fix that! Your new Kalimeris is lovely, Carol. I've never heard of this and thought at first it was a new coneflower hybrid. But how special to have something from Elizabeth Lawrence's garden. I, too, am waiting for the frost and enjoying what blooms there are while I can. Your asters are still beautiful. I always forget to cut mine back, too. 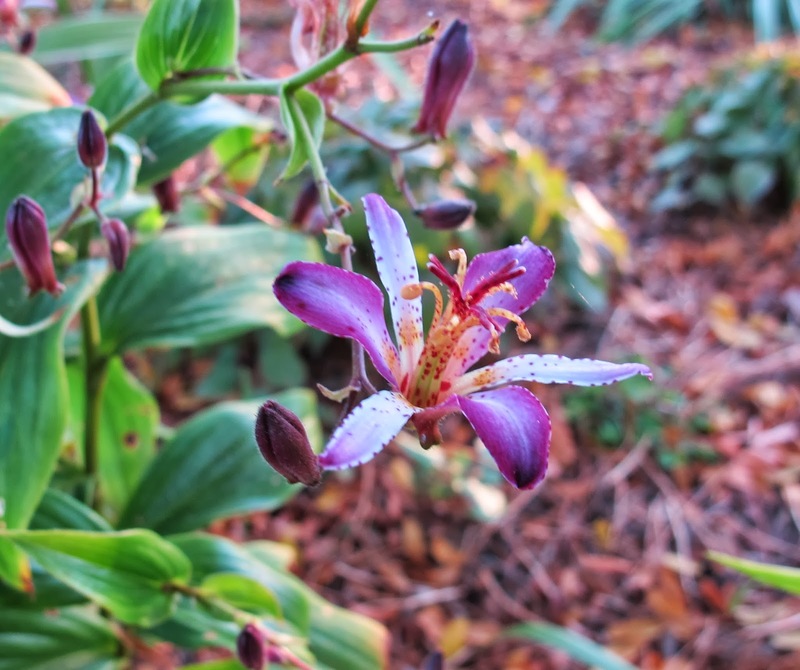 Your toad lily is lovely. I don't think I've ever seen this flower in person. Thanks for hosting. I love the colour of your aster, even if it does have unsightly legs, but I am most taken with the Oxford Orphanage plant - pretty flowers and a very intriguing name! Happy GBBD, and thank you, as ever, for hosting. Thanks for hosting once more Carol, I like your Kalimeris very much, must see if it is for sale over here. Your garden must be looking good with all your lovely flowers. My favorite is the goldenrod. Thank you for hosting! I love the colors of autumn, even if we don't get the degree of color changes those of you in colder climates get. Thanks for hosting GBBD, Carol! A happy GBBD to all. October in the Caribbean is hot and rainy with lots of weeds. No Fall season for us. I love the look of goldenrod and wonder if it can take the heat? Oh your kalimeris is most pretty Carol. I'm intrigued as to the origins of its common name. I have seen one or two of these at garden shows recently and have admired them but they have not been for sale :( Thanks as always for hosting. Thank you for hosting again, Carol! Sometimes my asters get crazy if I don't cut them often enough but drought kept them in control this time. Interesting that your fall bloomers are already fading: ours just geared up. Happy Bloom Day--I'm thrilled I remembered! I'm always grateful to have this lovely opportunity to assess the blooms in my garden: This month, it's everything I showed last month! Thank you for hosting, Carol! Thank you for hosting GBBD every month. I look forward to seeing what other gardeners are growing. Y'all provide so much inspiration! Thanks for hosting - I do like your toad lilies. AND I had a good giggle at some of your other recent posts - gardening isn't always such a serious business, is it?! Central CT remains frost and freeze free as well. One of these years I'm going to have to figure out a spot for some fall crocus. Happy GBBD! Autumn crocus are amazing. I first saw one years ago at an old house we were living in, a totally untended yard when we moved in. 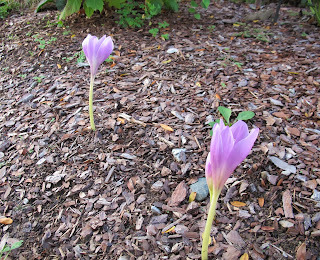 I couldn't understand why such a big crocus would be blooming in the fall! A little reading later and I discovered a new plant. I haven't read all 40 of the comments above, so I may be repeating: Your mystery plant with yellow blooms looks same as my Thread-leaf Coreopsis. Re. 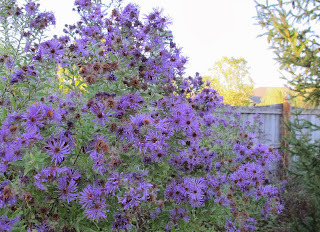 cutting back New England asters: I usually forget, too, but last year I remembered to cut them back. A happy accident happened. The ones around the butterfly bush were just the right height to fill in the leggy space under and around the shrub. So lovely that this year I didn't forget and made sure I did it again. Visualize pinky and purplely aster flowers with the last of the pink blooms on my butterfly shrub. The prettiest scenes in my garden usually are unplanned accidents. Keeps me humble. Whew! I"m not the only one who has neglected weeding! I love that Toad Lily and it reminds me that I wanted to plant some! Certainly Autumn is shaping up nicely in your garden Carol. I do like the look of that Toad Lily - I must look into that one. Nice colchicums! Mine seem to have disappeared -- good excuse to order more, right? Hi Carol. Enjoyed seeing your garden! I wonder if deer eat kalimeris because mine have pretty much disappeared. Maybe it's all the shade they're now in. That's a pretty cultivar you've grown. You sure have to look close to see any blooms in my garden this OCT. Happy GBBD. Great looking Kalimeris - is it double in the center? As for the Colchicum and autumn-blooming crocus, I'm sure you'll let us know what you mix them with, as it's been a personal conundrum of mine as well. Thanks for hosting! I hope your new colchicums thrive. 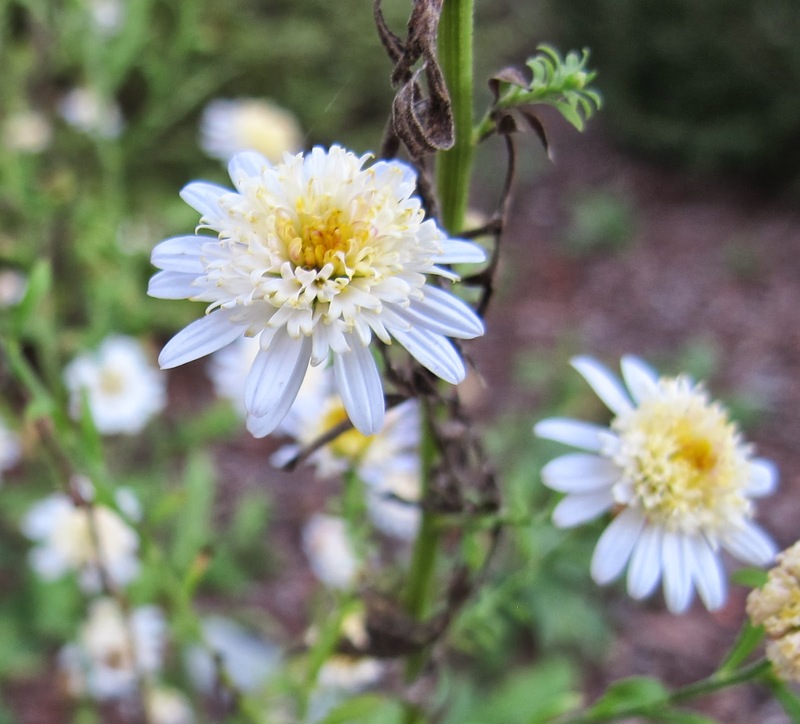 It's hard to like October in the garden, but your flowers are still lovely! Toad lilies are one of my favorite fall flowers; It will be another week or two before mine are full of blooms. Thanks for hosting GBBD. Thank you for hosting, Carol. We've had frost several times already... but I found some hardy survivors to share. 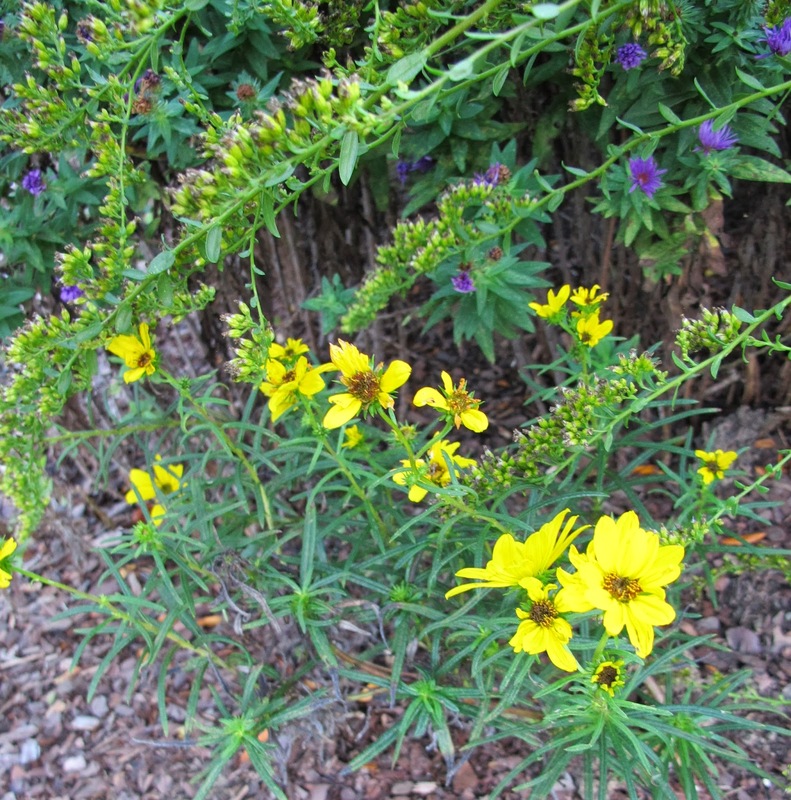 Your fall asters are beautiful, and the yellow plant's leaves do look like coreopsis. I love your garden! Thanks for hosting! It's a wonderful bloom day here in Central Texas. Thanks for hosting. 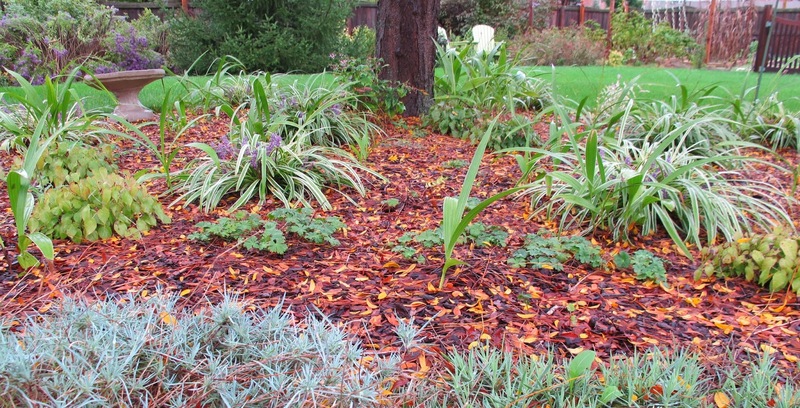 We're finally getting some rain and the fall blooming plants are really responding. Your Kalimeris looks kind of like some of the newer Echinacea in form. My 'Solar Cascade' is still blooming, the others are turning brown. I hope they set seed, I might try sowing it. I'll have to try cutting them back next year to see if they will be shorter, most tended to flop this year. Your unknown one doesn't look like it is flopping! Oh, the asters are wonderful now! Blooming trees are getting harder to find as we move into fall. Thanks for hosting Bloom Day! I like the idea of your Birds' Blanket garden. What a great idea! We are having beautiful autumn weather, and the flowers and I are enjoying every minute of it! Just love asters. Yours are a deeper colour than mine. They're so reliable, aren't they? Colchicums prefer realy limestone soil. It is possible that is the reason of some failures with them. Late again and still not quite ready! I've linked to my post, but I won't have the photos up until later tonight (the 16th or even the morning of the 17th); gotta cook dinner and do a bit of preserving. Crazy time of year for a produce gardener to be writing blog posts! Ha, I have some of those stick-asters, too! I'm whacking them back hard this year. My asters haven't yet started to bloom, but pretty much everything else is. Happy GBBD and thanks for hosting. You have a lot going on up there in the North. Nice blooms.